The upgrade trick in Final Fantasy 3 is a bug that allows you to take items gained in combat and use them to turn other items in your inventory into other things and upgrade your lead character. There are plenty of methods stated on the internet for getting this to work, but are all needlessly complicated in execution. This article focuses on the causes of the glitch and is somewhat technical; a simpler explanation focusing more on the execution will be forthcoming. For clarity's sake, I used screenshots taken from a translated ROM. Each slot in your inventory is split between two bytes. The first is the "index", or what the stack contains. The second is the stack's "quantity", how many of an item is in the stack. Immediately following your inventory is your first character's vital statistics, but we'll get into that later. For now we'll focus on the inventory. ***IMPORTANT! *** The way your inventory is formatted when you're not in combat is different from when you're in combat. Keep this in mind when you're poking around the memory for yourself. The bug is the result of the battle's format, so we'll deal exclusively with that format. B2 is the index for SouthWind, and you have two; A6 is the index for Potion, and you have five; 1E is the index for Knife, and you have four; etc. The largest a stack can be is 99. If you have 99 in a stack, and you get an item drop, then the game deals with the extra item by finding the next empty quantity byte after the stack, dropping its index there and dropping its quantity in the next index. Let's demonstrate using potions. Now, combat is over, and you win a potion. So now you have 166 of nothing, and no kaiser claws (item at index 01). These values are meaningless, so they get zeroed when the inventory is reorganized. Get into combat and win a potion. So now the helmet stack no longer refers to index 62, but index 63, since the dropped potion's quantity got added to its index. Congratulations, you now have four onion helmets! Sometimes, you may win more than one of the same item in combat. If your stack of that item is full, the game treats each extra as a separate item and simply iterates the process described above. The good news is that you're almost always garaunteed glitchy behavior because of this. Let's use potions again as an example. 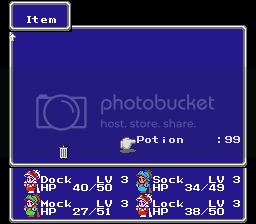 Before combat, you have a stack of 99 potions. You win two potions. It handles the first normally. It doesn't bother checking to see if the slot is occupied. This results in 166 of nothing, a stack of no kaiser claws, and a stack of 166 kaiser claws. You just spawned claws out of nothing. The other two meaningless stacks get discarded and the other stack gets reset to 99 since you can't have any more than that. So, now you have an onion helmet, but want to get the rest of the onion armor. You buy four leather robes and four copper rings, and arrange them in your inventory with your potions thusly. 73 and 8B are the indexes for leather robes and copper rings respectively. You get into combat and win two potions. │  described; index 73 becomes 74. │    │ there's a quantity here. └──But this one is empty. In one shot, your robe and ring have become an onion armor and onion glove respectively. This method can be done with any number of dropped items. Just remember that the process iterates itself with each dropped item and arrange your inventory accordingly. Here's a tip: the way the game checks for a quantity byte is by checking each odd byte in sequence after the full stack. It also fails to go back to the beginning of the inventory once it reaches the end of your pack. This means that there's opportunity to corrupt other pieces of data. Look back at the chart at the beginning of the article. 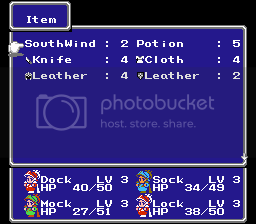 You'll see that your lead character's data comes immediately after your party's inventory. 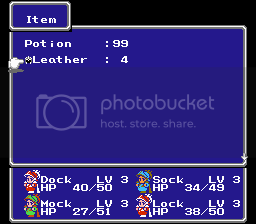 It is possible to abuse the game's method for dealing with extra items in order to give your lead character an edge. Cropping off the first three lines of your inventory, the memory block should now look something like this when in combat. Some notes: Like most systems, multi-byte numbers are read from right to left, so the larger digits are on the right. Strings, like your character's name, are read from left to right. odd byte after the potion in your inventory. This one──┘     │     └──But this one is! isn't empty...  │        Let's drop it here. The rightmost byte for your character's experience was set to A6. And since this byte represents the upper range of this number, this means your character just gained 10,878,976 experience in one round of combat. The game will reset this to 9,999,999 in a bit, but still, your character has the maximum amount of experience allowable. Since the game is programmed to prevent gaining more than one level per combat, this means your character will gain one level per round of combat. Note that also the lead's name gets affected; in this case, Dock's name is changed to Eock. You can do some other things with this too. Place the potion stack one space back and you can change your character's class. However, this is mostly pointless: Stat changes aren't made unless you go through the job menu. All glitching yourself a job does is allow you to equip different equipment; all other stats are transferred to the new job. You can also crash the game if you try this as a ninja. Also, if you have already performed the mass experience bug and get two potions with the same setup, or if you get three potions in one round without having done the bug, the character's max HP will shoot up to 9999. Plus, you can chain the bugs together. Place a stack to be upgraded at the end of your inventory, place the potion stack two spaces back, and get two potion drops in one combat round. You'll upgrade the stack and gain a ton of experience that way. Can you upgrade your other characters? Theoretically, yes, but you'd have to keep everyone else dead up until the ancient's labyrinth, and that's probably not practical. Can you do other things with the bug? Everything else is too far removed from the inventory to be of use. This list was pulled directly from EmeraldThunder21's savestate hacking guide.